Day 32...Circumventing the Australian continent...Seminar Part 2 was a success!! Thoughtful email from attendees! We were surprised by the number of attendees at our second presentation. "Sighting on the Ship in Australia"
Zebra painting located in the art gallery. Those of our readers who've followed along with us over these past years know how humbled and in awe we are of our lives. We never fail to remind ourselves to be grateful for each and every day of this unusual life and...for life itself. Awakening each morning to the joy of yet another day of life is a gift in itself. Good health, being together, living within our means and the love of our family, friends and new people we meet along the way only adds to the exquisite pleasure of traveling the world. The huge Colony Club was also packed for our second presentation. We ask ourselves, is it luck? The perception may be that we "landed on something." As we look back over our lives, we realize that getting to this point wasn't a stroke of luck. We gave up a lot and, over the long haul, we worked hard to make it possible. Many find our lifestyle foolhardy and impractical. Others revel in a sense of wonder over our "bravery." We aren't foolhardy and we aren't brave. 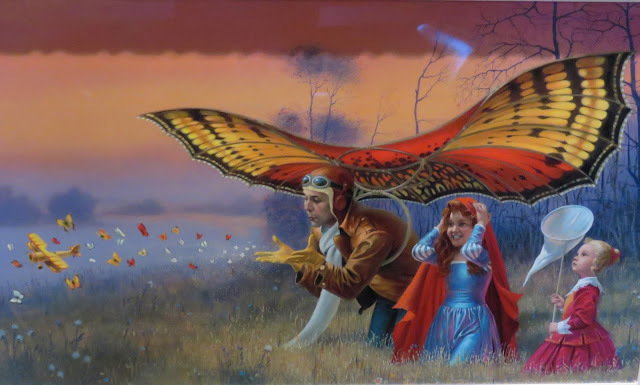 Is it foolhardy to fulfill a dream one is capable of turning into a reality? Is it brave to jump into the cool water of a pool on a hot day? No bravery required here. Tom was enjoying himself during our presentation. Then, what is it, if not luck? Many years ago I taught sales/motivational classes centered around the Dale Carnegie concept of the fact that there are five steps to making a sale; Attention, Interest, Desire, Conviction and Close. 1. Attention: That day in January, 2012 when I asked Tom what he wanted to do when he'd be retiring on October 31, 2012. He got my ATTENTION but could we make it work? 2. Interest: Once we started investigating the possibilities both financial and logistically, we developed a strong INTEREST in pursuing it further. 3. Desire: Once we realized it was feasible a powerful sense of DESIRE kicked in and we began to embrace the concept. 4. Conviction: The more we researched, the more committed we became and during the first 30 days, a powerful feeling of CONVICTION to make it happen captured us both. 5. Close: Like the finale of an actual sales transaction, we truly CLOSED when we began to pay deposits on future bookings and planned for the sale and disposal of all of our worldly goods. The ship is beautifully decorated for Christmas. These thoughts came to mind from so many year ago, as my brain was spinning with the enthusiasm we both are feeling from the second of two seminars we conducted for passengers aboard Royal Caribbean Radiance of the Seas. The positive feedback we've received from attendees both in person throughout these past days and by email has truly been overwhelming and appreciated. Who knew? Not us. We expected a handful of attendees when in fact there were in excess of 100 at each presentation. Go figure. Even staff at the customer service desk is prepared for Christmas. If we'd had more lead time to prepare and announce the two part series, surely we'd been able to garner more attendees. We can't stop smiling. This happy and fulfilling experience will stay with us for a long time. Will there be more in the future? In the next two days, we'll be talking to Kevin and Steve, activities director and cruise director respectively, to see if this can lead to something that appeals to us in the future. With bookings well into 2018, we'll have to see if it a possibility for us since its unlikely we'd want to change our itinerary going forward. We'll see how and if it rolls out. The ship is decorated for Christmas. We have attended both of your presentations and have enjoyed them thoroughly. Jess, you are a better speaker than MANY of the presenters we have had on many cruises. Good amount of both information, humor, pictures, and you have no repetitive phrases or awkward pauses - brilliant! I was a high school science teacher for over 20 years and have some familiarity with quality speaking. The other day we introduced ourselves to you in the Windjammer. We are the 2 gals who have lived full time in an RV for 22 years, while also doing international land trips, and many cruises. I’m sure we have been in more countries than you have, yet that doesn’t matter - we still learned a few things from you. Thank you for that. Since we often travel spontaneously, with hardly any plans, and no reservations, and hardly ever stay anywhere longer than 3 weeks, we found it very interesting to learn of your travel style. You are right; people have to discover what works for them, no matter what anybody else does. But you gave some excellent tips which everyone should know, just to be safe. Hoping to cruise with you again some time. We are so appreciative of this message from these lovely people. It means the world to us to hear from those we meet in our travels especially when they take a few minutes to say hello or share their story. Thanks to Mary and Elaine for sharing your thoughts with us! In the interim, we're down to our last few days aboard the ship, cherishing every single moment of this extraordinary adventure, made all the more exciting by the serendipity of our lectures and making so many new friends aboard the ship. Luck? Maybe a touch. Happiness? In abundance. In Fiji, one year ago, we drove under canopy of trees in a nearby neighborhood. For more details, please click here. The ship has been decorated for Christmas and looks beautiful. Another piece of art from the ship's gallery. Today, as we prepared the final details of our upcoming seminar, we thought it made sense to post the photos of the digital equipment we'll be discussing during the presentation. RFID (Radio Frequency ID) wallets which can't be scanned with illegal devices in an attempt to steal identity. As a result, today's post will include little verbiage and more photos. By doing so, it will be convenient and expedient for Tom to bring up the photos as we describe each item. Universal adapters. Without these, we've have serious electrical issues. Tomorrow, we'll share details about the agenda covering the logistics of world travel with less emphasis on where we've been and what we've seen. Also, we'll include the response from our audience as to these topics which some may find less interesting than details of our travels. Portable hot spot devices for various countries. In many countries we haven't needed to use these. In others, they were our only means of Wi-Fi. The two black devices top center may be used in many countries but often don't work as well as each country's own device. However, its all a part of the experience for those who choose to experience traveling over the long haul. Its not always as romantic and exciting as it may to be. Flash drive, a must for the savvy traveler. Our unlocked SIM card (mini or full size SIMs work) smart phones. Our cruise is quickly winding down with only three days until we disembark the ship to make our way to the airport for our upcoming three month visit to Tasmania. We'll be back tomorrow with more. Please check back then! This is a popular snorkeling area in Savusavu, Fiji with considerable coral reefs. For more photos, please click here. Day 30...Circumventing the Australian continent...Are we disappointed its ending in three days? This morning's sunrise from our balcony over industrial port of Auckland, New Zealand. Art from the ship's gallery. Tom and I both agree this cruise didn't seem to pass too quickly nor did it linger with hopes for it to end. We've loved every single day. But we bear no disappointment in it soon ending. Our journey continues on to yet another adventure which we anticipate with an entirely new sense of awe and wonder. No doubt, a big part of the pleasure we've experienced on this cruise has been the often hilarious and interesting evenings we've spent with our friends Lois, Tom, Cheryl and Stan and the many other passengers we've met aboard this lengthy cruise. Freighter and tugboats in Tauranga. Each early evening at 4:30 pm, we've gathered at the Diamond Club lounge with our four friends for our complimentary wine and cocktails taking advantage of one of the many perks provided by our newly acquired Crown and Anchor Society designation after acquiring sufficient points from past cruises to become members. With the friends preferring an early dinner, by 6:30 pm we all headed to the Cascades dining room to the same table each night for dinner. By 8 pm, our friends had their fill of a busy day and headed to their respective cabins for the remainder of the evening. More pretty views of port of Tauranga, New Zealand. Other than a few nights, Tom and I stayed out playing pool, dancing, watching shows and mingling with other guests not turning in until after 11 pm. By 6 am each morning, we were awake and preparing for yet another action packed day aboard ship or heading out to sightsee. Its been quite an ideal routine but, once we're settled in our new home in Penguin, Tasmania in three days, we'll be ready for a little more sleep and to establish another new routine we'll quickly incorporate into our lives, one we'll certainly relish with equal enthusiasm. City of Tauranga, New Zealand. Its been easy to "live in the moment" during this lengthy cruise. During this period, we've avoided conducting much research for future travels as each day aboard ship has presented its own unique brand of entertainment and diversions. Today the ship is docked in Auckland, New Zealand. We've decided to stay onboard to prepare for tomorrow's Part 2 of our world travel seminar which will be again conducted in the same venue at 11:15 am. The agenda is in place but we'll need to prepare the video portion of our presentation which may take few hours. The sea and an island at a distance. With many other passengers off the ship for various tours we'll have less distractions and zip through it in no time. We'd previously visited Auckland and have no regrets to be staying aboard the ship. This second part of the presentation will give us a better perception as to whether or not this is something we may want to explore for future cruises. Is the prospect of conducting seminars while cruising something that appeals to us? We aren't decided as yet, still uncertain if it will feel like too much like "work." Its for that very reason we've avoided writing a book or appearing on talk shows. Keeping our sense of freedom firmly implanted into our lives of world travel is vital to maintain the level of fulfillment we derive each and every day. If we commit to a greater degree of work than we currently perform in presenting our daily posts, it could change everything. We've loved the way it is. Why mess with that which isn't broken? Fishing boat in bay in Tauranga, New Zealand. People often ask, why don't you settle somewhere? Our answer is always the same, "Why change what we're doing when we already happy?" Recently, many have asked why we didn't tour New Zealand's South Island while spending three months in New Plymouth, located on the North Island? Here again, our answer was simple. We were experiencing so much joy on the alpaca farm, we saw no reason to change anything at all. But, isn't that how life is, as we always say, "Love the One You're With." If its not broken and we're happy, why change it? The big and busy city of Auckland, New Zealand. We're not subject to some perceived notion of what we should be doing, as opposed to what we want to do. A big piece of the magic of our lives, is in living our lives as we choose, on our terms, maximizing that which proves to provide us with the most enrichment. May your day be enriching and meaningful however you may choose to spend it. In Fiji, a neighbor's newly planted garden coming to life. Many Fijians plant gardens in the rich soil. For more details, please click here. Day 29...Circumventing the Australian continent...Finally at a port of call in NZ...Did we forget something? Boats in the harbor in Tauranga, New Zealand. We have such fond memories of the three months we spent in this beautiful country. The second leg of this 33 night cruise is our 16th cruise in four years, averaging at one cruise every three months. That's not to say we've booked cruises for such an arbitrary schedule as four per year. Its just an average. 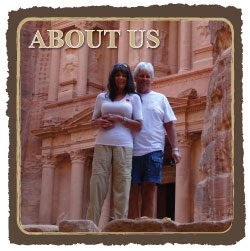 During our first year of world travel, we embarked on eight cruises in a little over five months. Then, we had a 14 month gap with no cruises at all. From there, we slowed down a bit to the current total of 16 cruises. While taking this photo I thought, "Humm...this looks familiar." We've only taken about 10,000 photos since taking this shot. It would be easy to forget. We book cruises when we find good deals with lots of perks in locations convenient to where we are at any given time. Different from many cruise enthusiasts, we don't necessarily focus on new ports of call we'll visit, although this is of interest to us. Instead, we focus on our joy of cruising and using a ship as our temporary home for a few weeks and in this case, for over a month. Sure, the cost for cruising generally exceeds our preferred average daily cost of around US $200, AU $268, including vacation rental fees, transportation, visas, food, insurance, entertainment, Internet and miscellaneous. Forest along the seaside in Tauranga. In five days, we'll be sharing our total expenses for this 33 night cruise including average daily costs, our final cruise bill for both legs and any incidentals we may have purchased along the way. Please check back for these totals. After our change in course due to inclement weather, the last week's cruise itinerary has changed dramatically. Today, we're in Tauranga, New Zealand during which a funny thing happened to us. Well, it was funny to us anyway. The town of Tauranga, New Zealand. 114,789 people usually live in Tauranga City. This is an increase of 10,905 people, or 10.5 percent, since the 2006 Census. Its population ranks 6th in size out of the 67 districts in New Zealand. Tauranga City has 2.7 percent of New Zealand's population." After four days at sea, passengers were chomping at the bit to get on land. We never mind sea days. The ship has been our home for this month and we're happy whatever we're doing, wherever we dock. Its not unlike our daily lives. Not only are we grateful and enjoy the exciting days, we've found the quiet and mundane days to be enjoyable in their own way, as is the case for many of you. Not everyday has to be emblazoned in our minds as highly memorable. With today's port of call of Tauranga, we decided to get off the ship. I took a few photos from our balcony early this morning. Neither of us were hungry so we decided to skip breakfast and eat later if we're hungry. As always, we set up our laptops in our usual Latte tudes Café on the fifth deck where we are often able to find comfortable seating with enough activity in the background to further entertain us while we work on the day's post. As we walked toward the port exit, everything started looking familiar. This morning, we met with Kevin, the ship's activity director, to discuss a possible Part 2 for yesterday's successful seminar. He'd received lots of positive feedback from passengers wanting to hear more of our story. Of course, we're flattered to hear this including all the positive feedback we received all day yesterday and again this morning after yesterday's "event." We couldn't be more pleased that our seminar was a success. Seagull hoping for a morsel from tourists. Now, we're scheduled to conduct Part 2 in two days, another sea day, and we hope for yet another good turnout. What a great opportunity for us! This morning instead of preparing the post, we created the new agenda and we're comfortable with the content. Since this information is so readily available in our minds no rehearsal is required, only the agenda to refer to on my laptop during the presentation. No stress. No worries. We're totally at ease with the entire process. Once we completed the agenda we decided to postpone preparing the post and head out to see Tauranga. Its cool here today so we bundled up in jeans and parkas planning to spend a few hours visiting the town, a not too distant walk from the port. Here's another of New Zealand's beautiful skies. Once we entered the port exit gate, we looked at one another and laughed aloud. We walked this entire town in January when our then ship visited this same port of call. Somehow we'd both forgotten we'd already toured this charming town. Cold and windy, we turned around and returned to the ship but not before we took today's several photos. There was no point in spending too much time in a port of call we'd already explored at length. Here's the link to our original visit in January, 2016. Once back on board we busied ourselves working on today's post and photos and soon, when done, we may just make a stop at the Windjammer Café on deck 11 for a light bite to eat. The beach along this area in Fiji was mostly rocky. For more details, please click here. It had been a long time since I'd done a seminar. Artistic renditions of square frames located on a stairwell. I don't know where to begin in describing our experiences in doing a seminar about our world travels on Royal Caribbean Radiance of the Seas. With little time to prepare, we did our best in putting together an agenda we hoped would appeal to the 20 or so attendees we anticipated. Note our talk scheduled at 11:15 am on today's ship Compass program. When the huge Colony Club began to fill with over 100 passengers minutes before we were to begin our talk, I found myself blissfully at ease in anticipation of presenting our story. Tom, too, was comfortable and relaxed. After all, it wasn't as if we had to memorize anything. We've lived it. And to have the opportunity to share it in this group setting was an experience beyond out wildest dreams. Tom chimed in on several occasions and did a fabulous job. Not only were our new friends in attendance but also dozens of other passengers we'd met at various meals and activities. Then, there were the dozens of others we'd never met who thought they might enjoy hearing our story. How humbled we were at the end when the applause was robust and enthusiastic. Go figure. Who knew this amazing experience would be added to our repertoire of extraordinary events in the lives of these two nomads content to live this obscure life on the move? The seminar went better than we'd expected. Having expected a bit of nervousness when we started, I was pleasantly surprised at how the unscripted presentation flowed for both of us. For us, it was not a lot different from our usual banter at the dinner table with eight or ten of us in the dining room. I love the look on Tom's face in this shot. Tom ran the video portion of the presentation with ease, flipping through some of our posts that we thought might be most exciting to share. With almost 1600 posts to date, it wasn't easy to pick the choose the eight or so we choose to put on the screen. Tom managed the video presentation while I talked. We were a good team. After the question and answer period, dozens of people stayed behind to chat with us which continued well into the afternoon, resulting in today's very late posting. We apologize for the inconvenience in being so late today. As soon as we were done, Kevin, the activities director who stayed during the presentation, asked if we'd be interested in doing a Part 2, before the ending of the cruise which occurs in six days. Tomorrow, after giving it some thought, we'll make a decision and post it here. There were over 100 people in attendance at our seminar. The ship is still rocking and rolling but we're blissfully content, feeling very grateful and blessed for this new adventure. Who knows what the future holds? For now, we know we have the almost next two years of world travel planned as we look for more for the future. Pinch me! Life is good. Ocean views never disappointed in Fiji. For more details, please click here. Last night, we'd decided to call it a night early heading to our cabin around 8:30 pm. We were in awe of the sky view awaiting us from our balcony. An interesting piece of art from the ship's gallery. More days at sea as we make our way through the rough seas which lessens a little each day. One week from today, the cruise ends in Sydney where we'll fly to Tasmania to begin our five hour drive to our new home for six weeks in the town of Penguin. Much to our pleasure, we don't dread the cruise ending as many have expressed, that returning to the "real world" is trying for some passengers, many returning to work and responsibilities, others retired returning to less excitement and adventure. The first Christmas tree we spotted in Adelaide. With the utmost of enthusiasm we anticipate this next leg of our journey, expectations in check, tinged by a degree of confidence that we'll enjoy both of the two locations in Tasmania in which we'll live over these next three months. From there, another 12 day cruise, a 40 night stint in Sydney and then...we're on our way back to the US for a nine night Alaskan cruise. From there, we're off to Minnesota and Nevada to see family for nine weeks. The clouds changed rapidly as we shot photo after photo. One of our readers inquired as to whether we'd continue with our posts while in the US. Of course, we will! We'll be busy with family but visiting many venues in the process. Minnesota is a beautiful state. We won't have any trouble finding plenty of photo opportunities during our six week visit. The final three weeks in Nevada will provide more photos and stories. Soon the cloud formation began to waft away. As for the moment we're preparing for an unexpected situation we'd hardly anticipated. The ship's activities staff has asked us to do a seminar on our world travels tomorrow morning at 11:15 am in the huge Colony Club. We couldn't be more thrilled. Although we'll only have 45 minutes, it should be ample time to share our story. Tomorrow, our seminar will be listed in the daily Compass newsletter as a planned activity for passengers. We sure got a kick out of this sign outside Sean's Kitchen in Adelaide since "streaky" bacon is one of the favorite staples in our way of eating. Tonight at 7:30 pm, we'll be interviewed on camera by the both the cruise and activities directors, Steve and Kevin respectively, which will be shown on TV tomorrow morning during the ship's usual morning show explaining the day's activities. We'll be busy preparing our agenda in the morning and have decided to postpone the usual daily post until later in the day. At that point, we'll have an opportunity to share how it went with all of YOU. Please look for tomorrow's post approximately five hours later than expected. Wow! Go figure! Bernardo, our cabin steward, made this adorable "lobster" towel arrangement which we found on our bed upon returning to the cabin at the end of the evening. One never know what to expect in this life of ours. More often than not, the surprises are exciting and often life changing. We continue to be in awe and humbled by the opportunities that come our way. For our friends and family in the US we hope your Thanksgiving was memorable and for those of you who partake that Black Friday sales not too overwhelming! Our short term vacation condo in Scottsdale, Arizona in November, 2012 where we lived for a few months as we finished the final preparations for leaving the US. 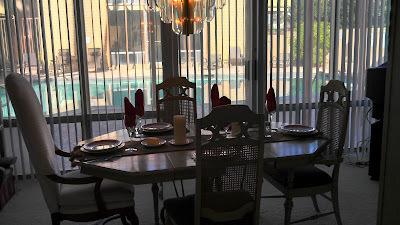 We had the table set for company when two of Tom's sisters and one brother-in-law (who live in AZ in the winter months) were coming for dinner. For more details, please click here.